After nine months of non-stop travel through eight countries I have reached the point of exhaustion. Now don’t get me wrong! I am not tired of traveling the world just yet, but I have gotten a bit tired of changing places every three to four days. I don’t like routine very much and I admit I do get bored easily but for the first time during these nine months I am craving a bit of routine and calmness. I also needed to take a vacation from my mind. As of December I have been feeling a bit anxious/worried about what it is that I am going to do (to earn a living) when I get back to the States. I enjoyed my last job and my work colleagues very much but I am thinking I might make a few changes in my career… maybe. My mind has been running like crazy, and it does not want to stop! I have been planning, thinking about the future, trying to set goals, etc., and frankly, it is exhausting! I needed to stop the thinking madness and come back to living in the present. I needed to take time out to just be, NOT think, NOT do, but just BE in the here and now. A couple of friends suggested that I go to Bodhi Zendo for a few days. They told me it was a very beautiful and calm place located in the cool hills of Perumalmalai where one can practice Zen meditation. I thought that even if I could not calm my mind, spending time in the hills would be a very nice break from the hot and humid places where I have been so far. Without knowing anything about Zen meditation, and just trusting my wise friends, I went on the Bodhi Zendo website and reserved a room and a spot on their next sesshin session; which consists of three days of intensive meditation and complete silence. This is just what my mind needed… but of course I was a bit nervous about being silent for three days. This time turned out to be pretty relaxing. You are asked to stay away from electronics and even reading books so if you follow the recommendations, it forces you into a lot of inner-reflection; which can be good and sometimes a bit rough, depending on what is on your mind of course. The zazen or the meditation sessions provided the perfect opportunity to calm the mind. That is if you can calm it… it took me a good day to get used to the routine but at the end of the three days I felt a lot calmer, more relaxed, and I even had a new perspective on the things that were worrying me. And when we were finally allowed to talk to others again it felt strange, I was actually missing the silence about an hour later. I ended up staying at Bodhi Zendo for an additional seven days after the sesshin. Even though we could speak, we were still asked to do a few hours of personal work in silence everyday. 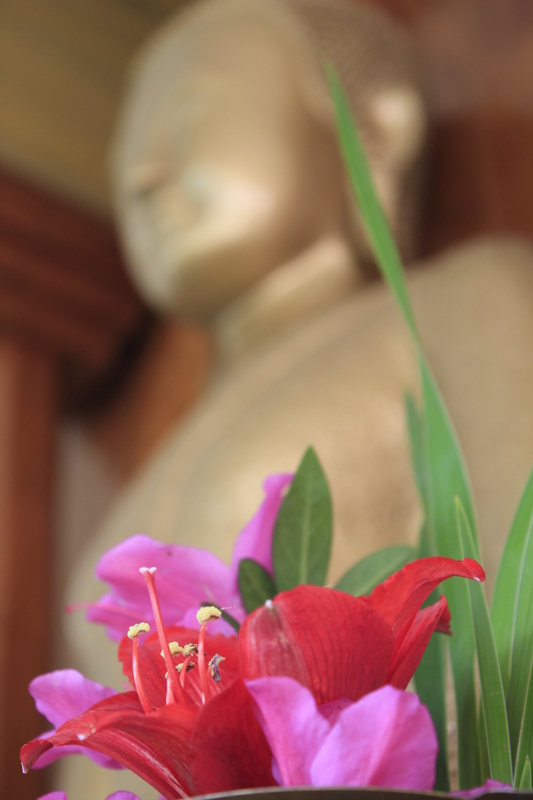 The Bodhi Zendo center was founded by Father AMA Samy, a Jesuit priest who trained and became a Zen master in Japan. 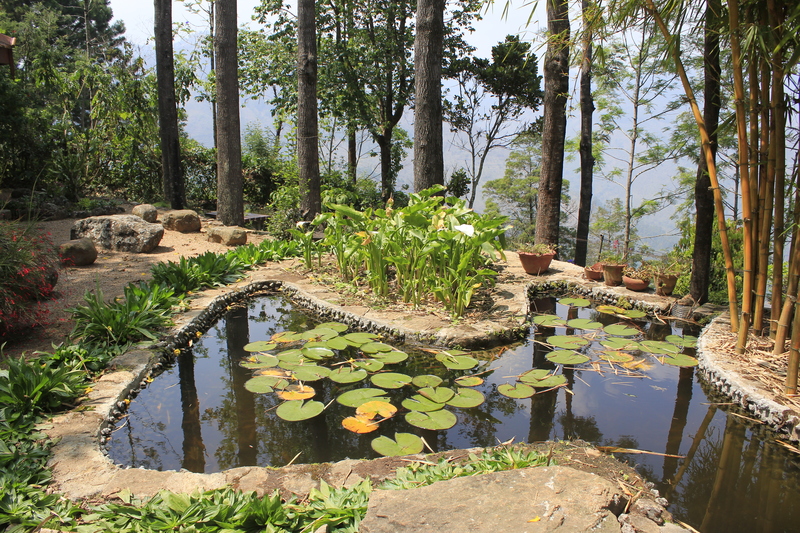 The cost to stay at the center is very low (as low as 400 rupees or US$6) and it includes the room, all meals, internet use, library use, garden use, and participating in any lectures given by the master and/or his disciples. Anyone can come to the center to learn/practice, regardless of their experience or religious background. It is a place with a very calm and friendly atmosphere where you meet really interesting, and spiritually-driven people from all over the world. Some of us are new here and others are faithful practitioners (or disciples) who come every year. Zen meditation has its roots in Zen Buddhism, a sect of Mahayana Buddhism. The Zen meditations are called “zazen”, the Japanese term for seated meditation. During zazen you must sit in samadhi or concentration, not do anything but just be, and to think not-thinking. Zazen is letting be and being. Follow your breath through your body as you inhale and exhale. Be aware of everything, your breath, sounds around you, your senses, and your thoughts, but without dwelling in them or holding on to them. Just see them pass by and let them fade away. Think about the koans; which are the deep, existential, and paradoxical questions that the Master gives the sangha (group). For example: What is the meaning of my life? What was my face before my parents were born? What is death? 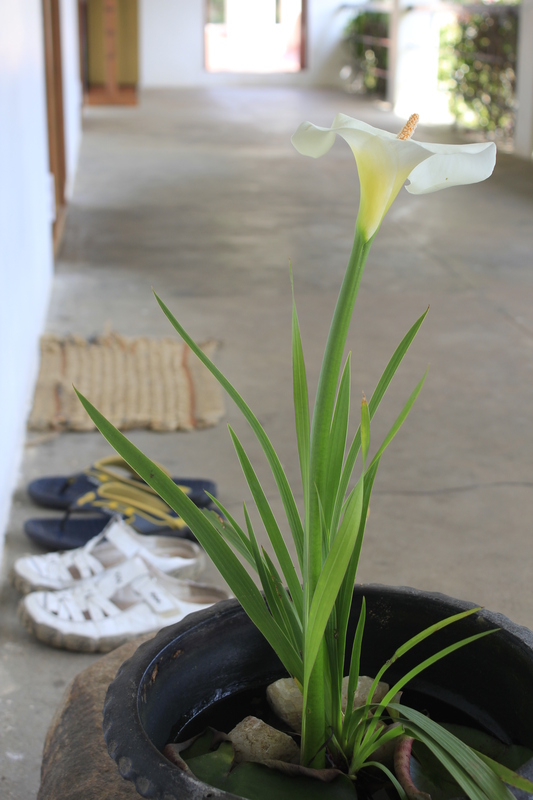 Part of our daily routine at Bodhi Zendo was the “Suma” or selfless work that we were asked to do every morning. We were each assigned a task to help with the general upkeep and maintenance of the center. It is like the “karma yoga” that you perform at an ashram. I have always found it therapeutical to clean. In my past life (before beginning this year of travel), whenever I felt sad, lonely, anxious, or nervous I always cleaned my apartment. I felt that if I couldn’t control some (troublesome) things in my life, at the very least I could have a clean place. Cleaning always made me feel a bit calmer; perhaps because the physical work not only helped me relieve stress but also helped me keep my mind occupied on something other than my worries. At Bodhi Zendo my task was to sweep the entrance road, a long stone road surrounded by giant trees full of leaves and flowers. The wind blew through the trees every morning making them shed tons of leaves and flower petals; which had to be picked up everyday. At the beginning I was having a bit of a hard time with the Zazen as my mind did not want to stop running and I would let the thoughts take over. When I eventually managed to concentrate on my breath and let the thoughts go, I would fall asleep. During that time the suma helped tremendously. The selfless work turned out to be my time of peace and calmness and I looked forward to it every morning. Even though it was tough work, the sweeping allowed me time to reflect, to relieve stress and relax in my own way. I met a couple of wonderful girls at the center who joined me in the sweeping, Kate and Kelly from Australia. We worked our butts off to get all the leaves and petals picked up only to find that the road would be back to its original state (full of dead leaves) a couple of hours later. But this didn’t matter to us, we still worked very hard to sweep it clean every single day. We found the work to be quite therapeutical and we related it to the “messiness” in life that often times leads to unpleasant, and negative thoughts. This constant sweeping resembled our continuous work to clean our minds of these thoughts. If we let the crap pile up it becomes harder to clear it up later. The constant sweeping of our minds is a necessity to stay sane and be at peace with ourselves. During the zazen sessions, we had an opportunity for the “dokusan” or an interview with the Master Fr. AMA Samy. I went to see him a couple of times and tried to ask him some of the koans (questions) that he had posed to us.. One day I asked him what he would recommend as a practice to find the purpose of my life. Another day I asked him what he thought about death. Both times I expected him to give me deep philosophical answers that would perhaps give me some sort of revelation but I only got really straight forward, simple answers: to find the purpose of my life he told me…”begin by doing something that gives you joy”. And about death he told me… “no one really knows, it is a mystery, so the important thing is to just live well”. Ha! moral of the story… keep it simple! Thank you for sharing your story. Meditation is powerful. Amiga no dejas se impresionarme; cuando regreses seras otra sigue adelante!